When a congressional think tank proposed overhauling the tax rules surrounding conservation easements in January, it hit private-land conservationists like a thunderbolt. As part of its 435-page report on reforming many aspects of the federal tax system, the Joint Committee on Taxation recommended cutting by two-thirds the federal income tax deduction for donating an easement. And it called for banning new easements on land where the owners live even part-time. Those reforms, the committee estimated, would eliminate about $100 million a year in tax breaks. Conservationists believe those reforms would dry up the flood of easements being donated by landowners, and jeopardize ecologically sensitive lands throughout the country. "It would be a radical change. Many land trusts would simply stop soliciting donations of conservation easements," says Russ Shay, director of public policy for the Washington, D.C.- based Land Trust Alliance. "Most people (donating easements) live on their property" at least part-time. But the thunderbolt didn’t come completely out of the blue. Conservationists have known for years that the easements system is overdue for reform, and in the past several years they have begun to make smaller changes in the system. Whether those reforms are enough to convince Congress to tread lightly on conservation easements in the upcoming battle over tax reform remains to be seen. To understand the drive for reform, you have to understand how loose the current system is. The looseness begins with the core calculation that determines the value of a conservation easement and, subsequently, what landowners can deduct on their federal tax returns. This calculation is the difference between what a parcel of land would be worth if it were developed and what it is worth when the development rights are voluntarily limited. Even if you don’t want to develop or subdivide your land, you can set the value of your land as if you do. To help determine the value, you hire an appraiser and a few other experts. If they hand in reports you don’t agree with, you can ignore them and hire someone else, looking for a more favorable determination. No one else has to approve the appraisal, unless it eventually catches the eye of a government tax auditor. To make the deal, you merely need to find a land trust that is willing to acquire the easement. Although the trust will likely promise to monitor the land periodically to make sure the terms are being upheld, it won’t know your tax write-offs, and often won’t even want to see your appraisal. "We worry about (the accuracy of appraisals), but it’s not really our business," says Ernie Atencio, director of New Mexico’s Taos Land Trust. "Land values are so weird around here, and in a lot of the West, with soaring prices, it’s hard to know (what an easement is worth)." If you can’t find a willing land trust, you can form your own trust, appointing yourself and your associates to the board of directors. Rock Ringling, a managing director of Montana Land Reliance, says he discovered one inbred trust, where board members are supposedly overseeing easements on land their families own. The practice is not illegal, but Ringling believes it is unethical. When he discovered the land trust had done "at least two easements I know of, and God only knows, there could be 20 easements," he turned them into the IRS. "The IRS never did anything." You report the value of your donated easement as a federal income tax deduction on form 8283 of your tax return, which is for any "noncash charitable contributions" that total more than $500 — the same form you would use if you donated a 10-year-old Ford to a local church. If you stretch the math too far, or take other improper actions, the IRS, or your state’s attorney general or revenue department, might bust you. But the odds of getting caught are minuscule. The IRS audits less than 1 percent of all tax returns — half the rate of 10 years ago, thanks to Congress squeezing its budget. And the IRS has given the noncash charitable contributions "abysmally" little attention, says a Senate Finance Committee staffer, who asked not to be named. The reason, he says, is that their value is hard to judge, "especially with conservation easements, where it’s not the entire value of the land, it’s a partial reduction (in the value)." The Land Trust Alliance and some of its 1,050 members began tightening up the system several years ago. The Alliance devised standards that land trusts can choose to adopt, to reduce conflicts of interest and improve the accuracy of land appraisals. The Alliance is also devising its own accreditation for land trusts, which would offer the more reputable trusts a seal of approval. Montana Land Reliance, the largest land trust in the Big Sky State, has been working for two years with about a half-dozen other Montana trusts to form an association that would act as a statewide watchdog. The association is about to hire its first staffer, Ringling says. The better land trusts have also grown wary of questionable deals. The Taos Land Trust declined to accept a couple of easement donations in the past year, Atencio says: "It looked like those easements were just going to help market developments." Meanwhile, a growing number of researchers in think tanks and universities point out a wider range of problems in the system. For example, most easements call for the land to be monitored forever, to ensure that generations of landowners are not violating the terms. But the big trusts like Montana Land Reliance, which has 13 full-time staff plus part-timers, typically check their easement lands only once a year. Hundreds of tiny land trusts have no staff and rely only on volunteers; those trusts often fail to monitor their land even once a year. Easements, which often protect a hodgepodge geography, are also taking the place of more orderly, large-scale land-use planning, says John Echeverria, director of the Georgetown Environmental Law and Policy Institute in Washington, D.C.
With easements, land is protected only where landowners are willing to make deals. "The spread of easements is making it harder and harder for governments to do effective planning and regulation," says Echeverria. "The message to landowners is that they’re only required to do what they want to do and are paid to do." Journalists — chiefly from The Washington Post — have also turned up the heat on private-land conservation. 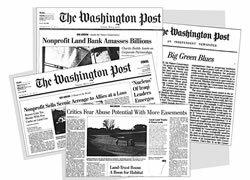 The Post investigated The Nature Conservancy in 2003, exposing dubious land deals, including some involving board members. Post follow-ups exposed a few smaller land trusts doing questionable easements, and wealthy landowners taking hefty tax write-offs for easements on golf courses, dude ranches, "country manors," and bits of open land in ritzy subdivisions. Reacting to the clamor, several congressional committees have launched their own investigations of The Nature Conservancy, and of the easement system in general. "We’re seeing easements on people’s back yards, which really have no conservation value, and very little open-space value," says the Senate Finance Committee staffer, drawing from confidential IRS information. "We get people saying, ‘I didn’t build four McMansions that I could have on this suburban tract, I only built three, and therefore, since I didn’t build as much as I could have, I should get a charitable deduction.’ "
The IRS has also awakened. Last year, the agency issued general warnings to easement appraisers and "promoters" that it would begin examining their activities more closely. Then in April, the IRS announced that it is auditing the easement donations of 48 landowners, and will soon take a hard look at several hundred open-space easements. In May, the agency launched a barrage of additional audits, concentrating on Colorado landowners. Some reformers say the whole system of donating easements for tax write-offs should be scrapped. Instead, they say, the land trusts and government agencies should put more emphasis on direct purchases of easements. The Nature Conservancy already buys many easements, and agencies such as the state wildlife departments make grants directly to landowners for easements. If the purchasing efforts were expanded, landowners could be required to compete against each other to put together the best easements. "We’d get the best bang for our buck," says Nick Parker of the Property and Environment Research Center in Bozeman, Mont. Other reformers call for centralized public registers, where the acres and terms of easements would be available for anyone to examine easily. Even if that reform comes about, almost all landowners’ tax breaks would remain private. When the IRS audits an easement deal, the determination is not made public unless it becomes a prolonged dispute that reaches a public court. And that’s only happened a few times in the entire history of easements. The most basic piece of information about easements may never be known: Just how much does the public pay for all the easements? "There is absolutely no difference" between the government handing out tax breaks, and handing out taxpayers’ money directly, says Jeff Pidot, an attorney and land-trust board member who researches easements for the Lincoln Institute of Land Policy in Massachusetts. When one taxpayer gets a break, it shifts the tax load to everyone else, he says. Researchers guess that all the federal tax breaks for easements — including estate taxes — total between several hundred million dollars a year and a billion dollars per year. That’s a drop in the bucket compared to corporate tax breaks, but it’s still substantial. And since there is no cap on the total, conservation easements are basically a government program with an unlimited budget. Pidot sums it up: "There’s nobody at the steering wheel." Yet it’s unlikely that Congress will carry out the Joint Taxation Committee’s call for drastic reforms. Easements still enjoy broad political support because they don’t impose government regulations, and because the wealthy people who enjoy the tax benefits give money to both political parties. The Senate Finance Committee, which has the power to draft legislation and has taken the lead on tax reform, is expected to issue its recommendations in several weeks. It may call for stiffer credentials for easement appraisers, more proof that an easement has conservation value, and other reforms, short of attacking the tax breaks. Sen. Charles Grassley, R-Iowa, and Sen. Max Baucus, D-Mont., who run the Finance Committee, have been working with land-trust leaders for years, pushing for more tax breaks to encourage working ranchers and farmers to donate easements. But the winds of reform have temporarily swept aside their desire to do more for cash-poor landowners. "There’s going to be some real collateral damage," from the reformers’ crackdown, such as further delay in reaching out to working ranchers, says Ringling, at Montana Land Reliance. "But I think it’s time the (easements) industry grew up."